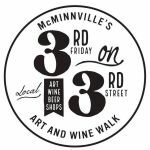 Come downtown and experience 31 carefully curated storefronts open late and featuring local artists, craftspeople, musicians, mead, beer, wine, and cider on a six block stretch of 3rd Street in McMinnville. Check in at the 3rd on 3rd table at Hotel Oregon, then come see us at Yamhill Valley Dry Goods! Spend your $10 and receive 5 taste tickets, a commemorative glass, a wine bag, and a map of the event. additional taste tickets are available for $1 each. Proceeds Benefit McMinnville Education Foundation.